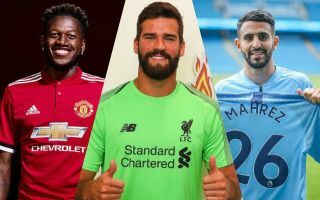 Now that the madness is all over, here’s our definitive ranking of the 20 best Premier League signings of the summer just gone. It’s very good news if you’re a Liverpool fan, less so for Arsenal and Manchester United fans. And Tottenham fans, well, you probably needn’t bother reading this article anyway. One of the most solid and reliable centre-backs in the country, and signed for dirt cheap from relegated West Brom. Jonny Evans should prove a very useful purchase for Leicester. Snapped up on a free on deadline day, Bernard had been linked with bigger clubs than Everton, so they look to have done very well there indeed to bolster their attack. Not a signing who’ll set the world alight, but Sokratis was a key player for Borussia Dortmund and brings experience to this Arsenal side after reportedly arriving on the cheap. A very ambitious buy from Burnley, with Joe Hart surely still having plenty to offer in the Premier League, even if he’d been frozen out at Manchester City and perhaps not looked entirely convincing in loans with Torino and West Ham. A decent signing on loan, though Mateo Kovacic remains something of an unknown quantity at the highest level, having rarely been a regular at Real Madrid. Could he therefore end up being the Alvaro Morata of midfield? Blues fans will desperately hope not. A very smart signing on a free, Max Meyer allowed his contract to run down at Schalke and had been linked with bigger names before rocking up at Crystal Palace. A slightly hard one to call, but this could end up being a bit of a game-changer for West Ham. Long regarded as a top talent, Felipe Anderson shone for most of his time with Lazio, attracting links to bigger clubs, but his career stalled somewhat as he played less often last season, and one imagines there must be a reason he never made it to a bigger name. Still, he has the natural ability to be the new Dimitri Payet for West Ham – as in, the good one who had a storming first season, not the one who got fed up and downed tools the following year. Wolves will be a very interesting team to watch this season as their wealthy owners and strong connections have given them a real edge in the transfer market, and Joao Moutinho is undoubtedly one of the most promising additions to their squad. For Wolves, also see Fulham, who have had a very busy summer and recruited plenty of players you could well imagine playing at top six clubs. Andre Schurrle shone for Chelsea earlier in his career and he could be a real difference-maker for the newly-promoted side. Not the biggest name in the world, but Arsenal urgently needed a new goalkeeper and they’ve got a pretty solid one here. There’s no guarantee at the moment that Bernd Leno will definitely edge out Petr Cech as first choice for the Gunners, but at least they now have a backup option that’s not David Ospina if Cech continues to perform poorly.